In this Cuisinart cpc-600 review we will tell you all there is to know about this digital pressure cooker. One of the things we found very useful is the low and high pressure option that this Cuisinart cpc-600 pressure cooker has. This is an option many people look for. Cuisinart is a very well know brand and has a good reputation. They make very affordable products and this Cuisinart cpc-600 pressure cooker is no exception to this rule. The most important part of a pressure cooker is the cook-pot of course. The Cuisinart cpc-600 comes with a dishwasher safe non stick pot that is easy to clean by hand or in the dishwasher. There are stainless steel replacement pots available if you do not like the non-stick inner pot. Have a look at this link ==> Stainless steel 6 quart cooking pot <== With it's 1000 watts it is in the same range as most pressure cookers we reviewed. The Cuisinart pressure cookers all come with the latest safety features. The pressure release valve will automatically open when the pressure or temperature gets to high. The lid will be locked until the pressure is low enough to open the lid and the power will shut off by itself if the cooker is heating without any food in it. have to set the time manually. 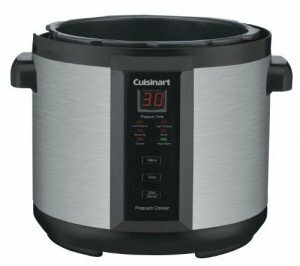 Click here to see the price on AmazonAfter reading a bunch of customer reviews we found that there are a few things real good about this Cuisinart cpc 600 pressure cooker and there are some things that might make you look for an other brand or model. Lately more and more electric pressure cookers come with pre-settings for cooking certain kind of foods that many people use a pressure cooker for. This particular Cuisinart model have some pre-settings for Browning, Saute, keep warm and Simmer, but the pressure cooker time still has to be set manually. If you are home and have time to prep your food and safe time by using a pressure cooker this might be a good product for you. If you on the other hand would like to prep your meal in the morning and find it ready when you come home end of the day this is not the model you are looking for and we recommend to have a look at our Instant pot IP=Lux60 review. There is nothing wrong with this pressure cooker, but it comes with a little learning curve. With over 1000 reviewers and an average of 4.2 out of 5 stars and the name Cuisinart behind it this is a good product. Like always there is the occasional lemon and we always recommend to test your pressure cooker as soon as you receive it and return it and ask for a new one or refund in case of any problem. Read all our electric pressure cooker reviews here.